For the first time, the Internet has become a hot subject in an election. In every debate, candidates are taking a position on privacy issues such as mass surveillance and net neutrality’s pros and cons to finding a balance between personal privacy and helping law enforcement find terrorists. 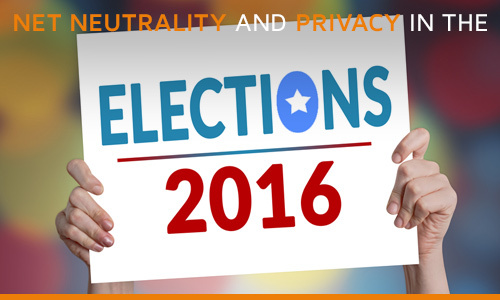 Net Neutrality pros and cons are a part of the discussion and the candidates weighed in. These rules, the President assured, are not intended to put undue burden on ISPs. They are designed to keep the Internet open, protect freedom of speech and foster competition and innovation. 11 months since its enactment, Net Neutrality seems to be working. Net Neutrality prevents huge providers from making unreasonable monetary demands on smaller competitors to use the Internet. Others argue that amid already stifling regulations, Net Neutrality will open the door to the FCC micromanaging the Internet and imposing taxes because it is now classified as a utility. Bernie Sanders voted YES on establishing Net Neutrality. No preferential treatment for corporations. Hillary Clinton: In her speech to Silicon Valley in February 2015, Clinton vowed to back the strongest possible Net Neutrality rules. Martin O’Malley is on the record as having agreed with President Obama on this issue, who is a strong supporter of Net Neutrality. Donald Trump feels that Net Neutrality aka The Fairness Doctrine will target conservative media. Though he has not mentioned seeking to overturn it, he has made his concerns known. The question of who favors stronger privacy rights isn’t quite so neat. Interestingly, the list of candidates in favor of less snooping comes from the farthest left and right of center. “The National Security Agency’s data collection program went too far in collecting phone records of Americans,” Cruz has said, while other candidates argue that surveillance produces greater security. Hillary Clinton has been on both sides of the issue: As a senator, she voted for the Patriot Act, which permitted much of the surveillance in 2001, and to renew it 5 years later. But after a federal court ruled in May 2015 that the telephone metadata-gathering program was illegal, she began advocating for tighter restrictions on the NSA’s information gathering. Bernie Sanders is vehement about privacy rights and against mass surveillance. Voted against the Patriot Act, but in favor of the first version of the Freedom Act, which placed some restrictions on the NSA. Hillary Clinton is in the middle on this issue, now upholding federal court ruling but was in favor of Patriot Act and voted for the Freedom Act. Martin O’Malley is in favor of strong privacy rights. Donald Trump is in favor of mass surveillance and reinstating the Patriot Act, but would close loopholes in laws to prevent student data mining. Ted Cruz is a staunch supporter of privacy rights. He co-sponsored the Freedom Act and is outspoken against NSA’s methods. Jeb Bush: Believes government snooping is what is keeping Americans safe. He’s strongly in favor of mass surveillance. Privacy issues and an open Internet have become one of the biggest challenges we all face. We want to catch the bad guys, but don’t want to be spied on. Finding the balance will be difficult. See you at the polls!